Is There Such a Thing As Perfect Businesses For Christians? Quite honestly, there are so many businesses that Christians can do. Some may include products that are specifically designed for Christians while others may be designed with everyone in mind. Basically, any work that doesn’t involve you having to break the ten commandments can be considered the perfect business for a Christian. For some, understanding the difference may be difficult at best. Let me explain a few things here. If you love to help others and you are good at administrative work, you could run a Virtual Assistant business and look for Christian business owners to help. If you like to read books, you could come up with a Christian book business where you only promote Christian books and books written by Christians. You could also be in direct sales and market cleaning products or makeup. Just because they are not specifically designed for Christians doesn’t mean you can’t run the business and target a Christian audience. As a matter of fact, you don’t even have to target Christians if you don’t want to. The whole point of having a Christian business is to ultimately glorify God in your work no matter who you serve, believers or non-believers. 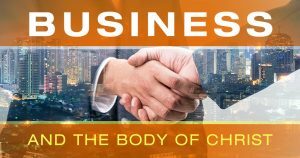 Running a business as a Christian gives you the title of owning a Christian business. When you look for businesses to consider, you can look at just about anything you want. Consider your hobbies and what you like to do. Also, consider products that you purchase on a regular basis as well. When you enjoy what you are doing, you will feel more comfortable marketing it. There are literally thousands of businesses that you can own. Here are just a few ideas to get you started on your research. When you own and operate a business, you choose how to run it and who you will deal with. The great thing about owning a business is you set the rules and guidelines. You can deal with any type of person or you can limit yourself to those that are Christians, but I wouldn’t suggest that. Why? Simple, who needs the message of Christ more, a believer or a non-believer? You are the one that makes all the decisions in your business granted you include God in all your decision making. God wants to help you grow your business, but ultimately He wants to be glorified through your work! Why Do Christians Struggle Financially?